Rockapella has become one of the world’s most sophisticated, lasting, and imitated vocal groups around today. Since the early ’90’s when they first achieved national television fame on PBS’s “Where In The World Is Carmen Sandiego?”, they’ve toured the globe and provided a funky powerful soundtrack to several generations of vocal music fans, while keeping it all fresh along the way. With buckets of catchy original pop songs, and complete contemporary revisions of sparkling Motown, pop, and soul classics, this group has always been the one to watch. ”Often imitated – never duplicated” applies here. Now they’re better than ever! As one of the progenitors of the astonishing full-band sound of “contemporary” a cappella, Rockapella has shown every audience the raw power of pure vocal talent and originality. The current Rockapella line-up features Scott Leonard (since 1991, High Tenor), Jeff Thacher (1993, Vocal Percussionist), Calvin Jones (2013, Tenor), Mitchell Rains (2016, Tenor), and Bryant Vance (2016, Bass). 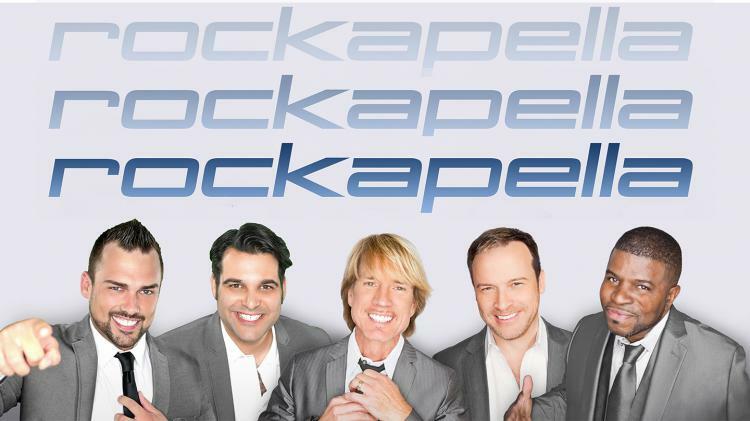 Rockapella has indeed proven that creating original pop & soul magic onstage is what sets them apart.